Ultrasonic amplitude boosters are fitted between the converter and the sonotrode. Thanks to the precisely controlled resonance compensation, amplitudes are achieved to match requirements. 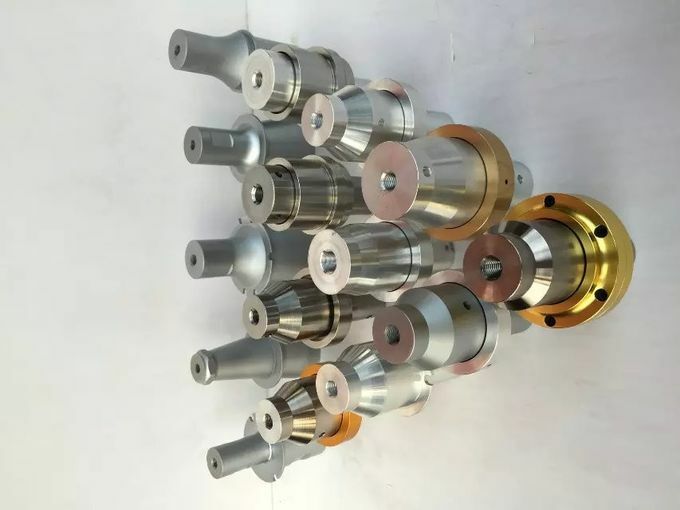 We provide a wide range of high quality ultrasonic transducer, No matter what kind of transducer you are looking for,We can make sure that you can find one at here. it is by utilizing piezo-electric effect to convert electrical energy into mechanical energy. The bolt-on type can make sure that the transducer can produce stable ultrasonic when load changes. We can make Ultrasonic transducer and booster available in Aluminum or Titanium in STOCK! 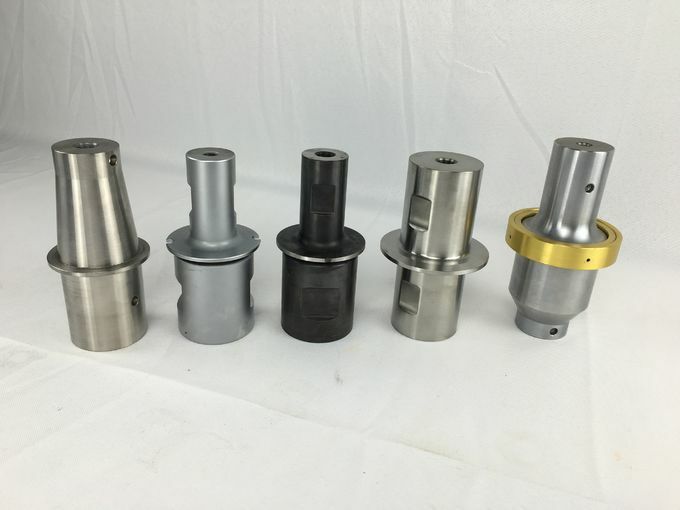 For use on ALL Sonitek, Branson & Dukane ultrasonic welders. What is a booster horn? A booster horn is a one-half-wavelength long resonant section made of aluminum or titanium. It modifies the amplitude of vibration applied to the horn. The booster is mounted between the converter and horn. To provide an amplitude change, the booster will have different diameters on either side of its center or nodal point. A smaller diameter at the end attached to the horns, means that the boosters horn is amplitude increasing. A greater diameter at the end attached to the horn means the booster horn is amplitude decreasing. Clamped at their nodal point, booster horns provide rigid support for the converter/horn assembly. Branson 20 kHz boosters for all 400 and 800 series welders. Fits the following models: 430; 470; 490; 4120; 8200, 8400, 8600, 8700, and 401 and 801 actuators. 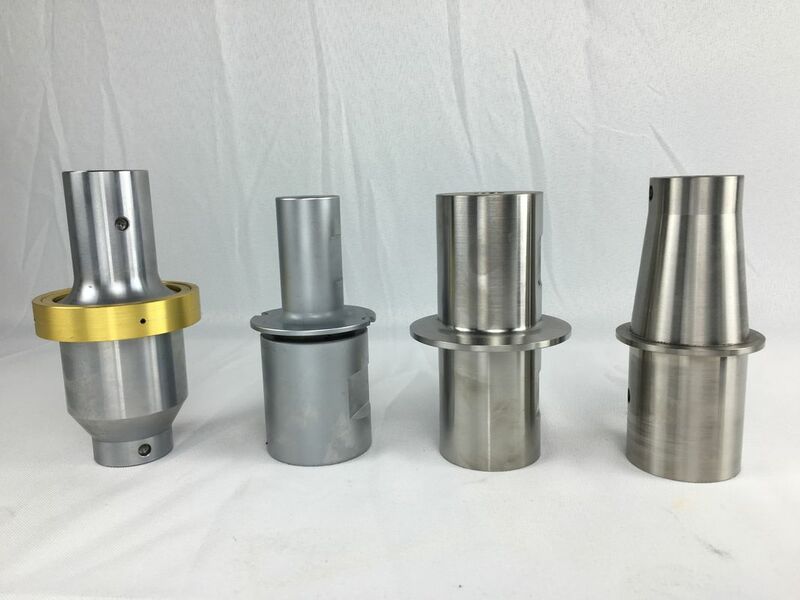 These used aluminum boosters have an input thread for 1/2-20 for the converter and an output thread of 3/8-24. The booster section of the welding stack serves two purposes, primarily to amplify the mechanical vibrations produced at the tip of the transducer and transfer them to the welding horn. Its secondary purpose is to provide a location for mounting the stack on the welding press. The booster expands and contracts as the transducer applies the ultrasonic energy. The booster, like other elements in the welding stack, is a tuned device therefore it must resonate at a specific frequency in order to transfer the ultrasonic energy from the transducer to the welding horn. In order to function successfully, the booster must be either one half of a wavelength of ultrasound in the material from which it is manufactured, or multiples of this length. Normally, it is one half wave length.